It has been a really busy month at Pixalytics with trips to multiple continents. We started with a trip to Bogata in Colombia for the kick off of a new project we’re engaged with, and we hope to tell you more about this soon. This was followed by a visit to Uganda for meetings and workshops relating to the Drought and Flood Mitigation Services (DFMS) project, which is part of the UK’s International Partnership Programme. We’re just over a year into the project, led by RHEATECH LTD, and we were demonstrating the first test version of the portal to both commercial and government users. The key to any beneficial system is to ensure that the solution developed is what the users want and need, and this was a great opportunity to gain feedback on the positive aspects of the system alongside a better understanding of required developments. For me it was really exciting to show, and discuss, satellite imagery with the people from the local area. It was really useful to increase my understanding of what I was seeing from space, and we even managed to identify a couple of small water sources that not everyone knew existed! Last week we attended two interesting and very different events. 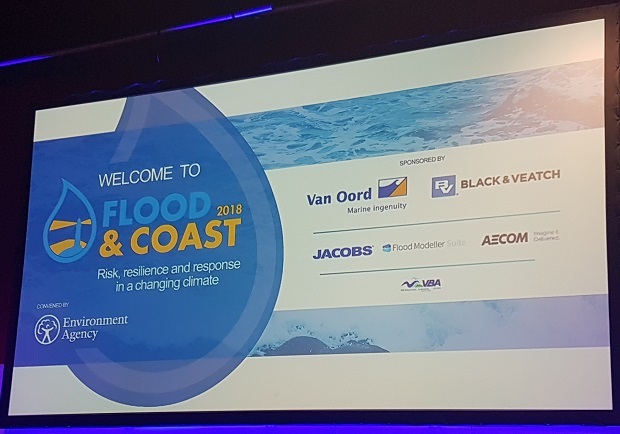 The first was the Flood & Coast 2018 Conference which took place in Telford. This was my first trip to this conference, and it was an interesting event. I gave a presentation about our portal and our intention to offer flooding products through it. It was part of a session called ”Technology & Innovation Presentations 2″ that took place at the end of the second day. Alongside us there were short talks on a diverse range of technologies including filter drains, rainfall capture and recycling, vegetated walls and mixed plastic recycling into building materials. My presentation seemed to go well as a number of people wanted to talk to me at the end. Unfortunately, the conference closed shortly after our session ended and so we all got ushered out. Apologies, if I didn’t get a chance to speak with you that day. Please get in touch, if you are interested in talking about anything further. I went from Telford to London and the following day and attended the Economist Sustainability Summit 2018. The event focused on the need for a societal transition required towards sustainability, alongside the roles in the change that need to be played by governments, NGOs and commercial organisations. For companies, there’s a need to work on solutions alongside providing leadership, which includes both the long term and showing consumers that their choices today can have an impact. Certainly, this topic has come to the public’s consciousness recently through the campaign’s relating to single use plastics and plastics in the ocean. Companies need to think about how to respond to these issues. The other point that struck me was that the large institutions such as credit agencies, risk assessors, etc., described how changes in the climate are now classed as a ‘known about risk’ that they take this into account when making their assessments. Finally, there was a surprise to come across phytoplankton in the exhibition as Orsted had an interactive video globe showing both weather and Earth observation data. March has been a really busy month. Looking forward to a few days of rest for Easter, and then onto April! This entry was posted in Business Innovation, Data, Earth Observation, Flood Mapping, Networking, Oceans, Remote Sensing, Satellite, Space Can Help, Uganda IPP, UK Space Industry and tagged Bogata, changes in climate, Colombia, DFMS, Drought and Flood Mitigation Service, Economist, Economist Sustainability Summit 2018, Flood & Coast 2018, International Partnership Programme, IPP, London, phytoplankton, plastics, Telford, Uganda by Sam. Bookmark the permalink.